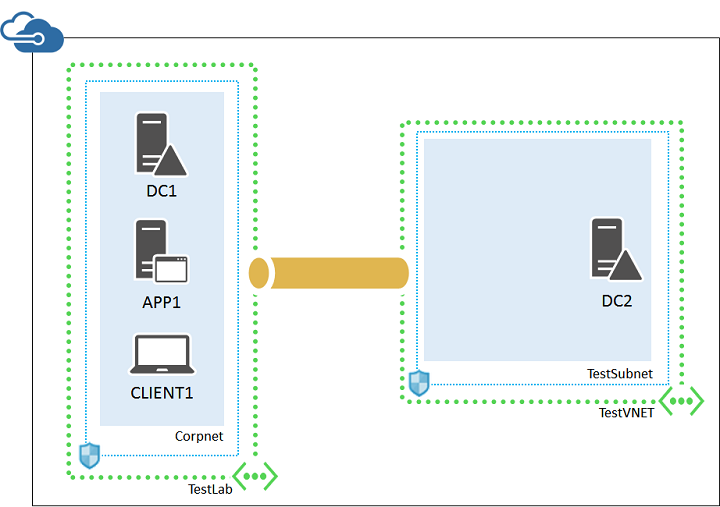 Therefore, due to the relative scarcity of these items (especially the public IP address), you can Set up a simulated hybrid cloud environment for testing, in which you create a simplified on-premises network in an Azure virtual network, create an additional Azure virtual network containing a replica domain controller, and then link the two virtual networks with a VNet-to-VNet connection. Here is the resulting confguration. You don't get the benefit of seeing it work from from your actual location on the Internet. However, you can still use this environment to experiment with Azure and experience many aspects of running IT workloads in a cross-premises Azure virtual network, and the only requirement is an Azure subscription.